Kris Compas of Illinois makes miniature rooms that feature incredibly realistic detail. She sometimes uses surprising materials to work her magic - for example, these pieces of pottery are made of quilling paper! After Kris rolls the strip into a tight coil, she gently manipulates it into the shape she has in mind and coats it with glue, inside and out. She evens out the surface with a Dremel tool and applies gesso to smooth it even more. Finally, she adds decorations and/or acrylic paint. 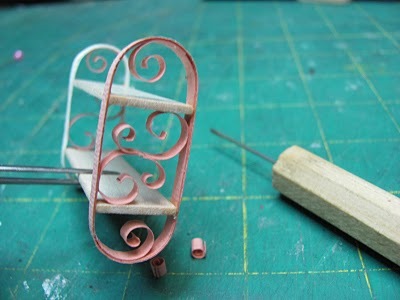 Quilling paper was used to make the decorative scrollwork on this little shelf. 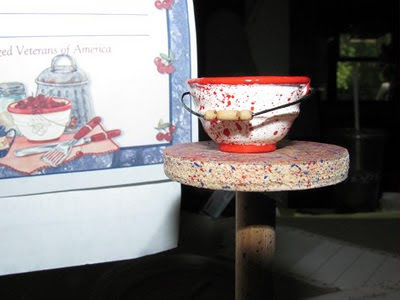 Recently Chris wrote tutorials for making paper baskets, complete with wire handle and twining instructions. I think it's safe to say there isn't anything she can't duplicate in miniature size. 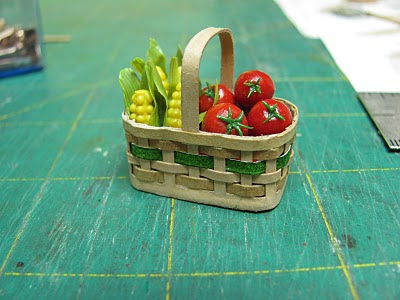 While they're not made of paper, take a moment to check out the upholstered furniture on her blog, 1 Inch Minis, too - wow! Wow, that is so darn creative! WOW! I used to collect miniatures when I was younger, and I'm still so fascinated by them. These things are amazing! I am totally in love with those little baskets. So adorable. All of her stuff is just incredible. Ann, I am so glad that you featured this artist. 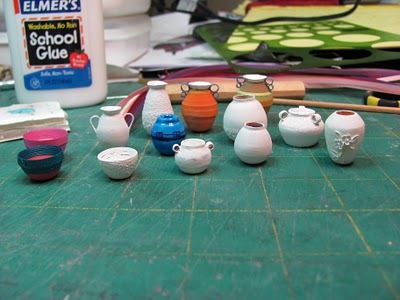 When I first saw her miniature pots, I was blown away. Kris leaves just enough texture when she manipulates a tight paper roll into a vase shape that it truly looks like hand thrown pottery. Just amazing! so creative. the baskets are amazing! So difficult to believe that they are made of paper strips. I love everything you show on your blog. I just start quilling and everything that you have on here is amazing and I hope to be able to create pieces as amazing as these one day. Thanks for your very nice comments, everyone. Sounds like you all share my enthusiasm for Kris's work. Angela, just keep at it and I'm sure you will.